I’m the only person in the world right now. A cosmic sky, an endless ocean and that enigmatic place where they meld beyond the horizon, a wondrous, sun-swept vista unfolds before me. The solitariness is striking. It’s a place where silk ivory sand slips through your toes, your breathing attuned to the rhythmic sighs and wanes of a lulling sea. I devour the moment. I admire the grandeur of it all. I contemplate the watercolour secrets of nature’s beauty. If you really need to get away, no one will find you here. Our expedition begins after touching down in Barbados, a tropical hub of colour and tourists and the main gateway to our intended destination. A charter twin-engine plane big enough to seat six people soars above a glistening, endless stretch of ocean for 50 minutes to neighbouring Union Island, one of the limited connections to this island in the sea. A quick shuttle bus ride ends at a nearby dock, where a ferry, awash in golden light, gently bobs in the marina. The first signs of twilight begin to form across a muted sky as we skip past Palm Island and the twinkling lights of Petit St. Martinique. It’s an exhilarating feeling, that 25-minute boat ride, as though we’re running to the ends of the earth to find paradise. We arrive between daylight and darkness. 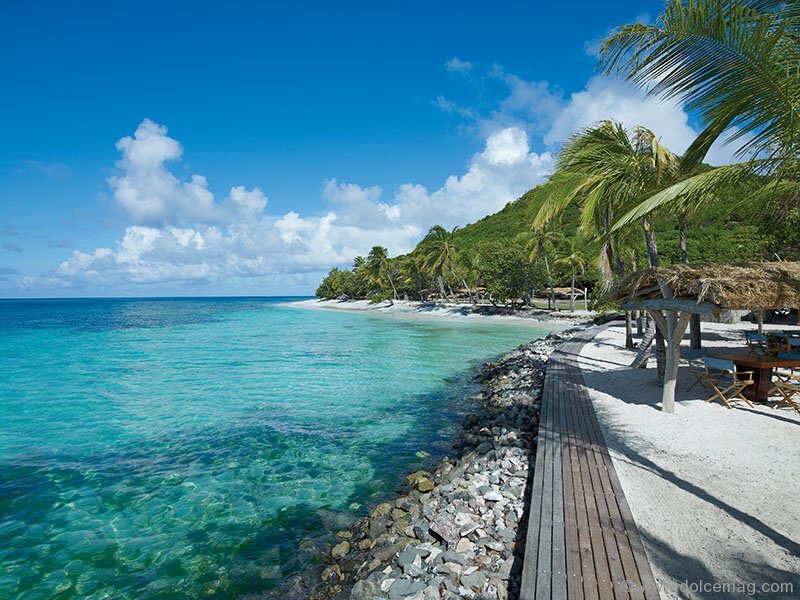 A dot of an island in the vast Caribbean Basin, along a chain of isles that compose the country of St. Vincent and the Grenadines, Petit St. Vincent rests upon 115 acres and is bound by the Atlantic Ocean and Caribbean Sea. With no formal check-in required, a powder blue Mini Moke zips us through manicured pathways towards our oceanfront accommodation. Visibly missing — and thankfully so — are towering hotels and casinos commonly found in resort destinations. Lining a two-mile stretch of beach are 22 — six two-bedroom and 16 one-bedroom — rustic cottages, which face the warm, windy Atlantic side of the island. With an open-concept living area, Balinese-inspired furnishings, a hammock, day bed and spacious teak deck set mere steps from the water’s edge, our first glimpse inside induces wide-eyed wonderment. The scent of frangipani flowers fills the night air, a sweet and sultry concoction. Supper of Caribbean callaloo soup, steamed mussels in a saffron cream sauce, banana sorbet and white-glove service greets us at the main pavilion restaurant, which infuses its alternating menu with fresh, local ingredients. Bottles of Château Lafite Rothschild, Courvoisier and Veuve Clicquot abound in the restaurant’s on-site cellar. While it often attracts honeymooners and high-profile businesspeople mostly from Canada, the U.S. and England, the island (which can be rented out entirely for almost $30,000 a night), has welcomed the likes of Denzel Washington, the band U2 and Carlos Slim, the richest man in the world. After purchasing the island in November 2010, Philip Stephenson and Robin Paterson of Freedom Resorts Ltd. established a plan to enhance and update the island. The 2011 renovation project heightened service, expanded amenities, and refurbished accommodations that now include air-conditioning and custom-made furniture. Additions include a new executive chef and restaurant, and a team of Balinese therapists rolling out relaxation at the spa complex embedded in the hills of the forest. Upholding its intended lack of connectivity, the project didn’t include the installation of phones or TV or Internet — or locks on your cottage door. “We try to encourage our guests to really switch-off and spend time with each other. We’re so locked into emails and computers these days,” says general manager Matthew Semark. “What PSV tries to offer is an escape from that. There are no distractions in the cottages, so guests have the opportunity to spend proper time with each other.” The island maintains its traditional flag communication system, which consists of two flags (yellow for service, red for privacy) located in front of your cottage. Simply mark what you want on forms provided, slip them in a hollow bamboo tube attached to a driftwood pole and raise the yellow flag. Efficient staff will deliver your every whim. For the adventurous types or the romantics at heart, two key attractions maximize the appeal of Petit St. Vincent. 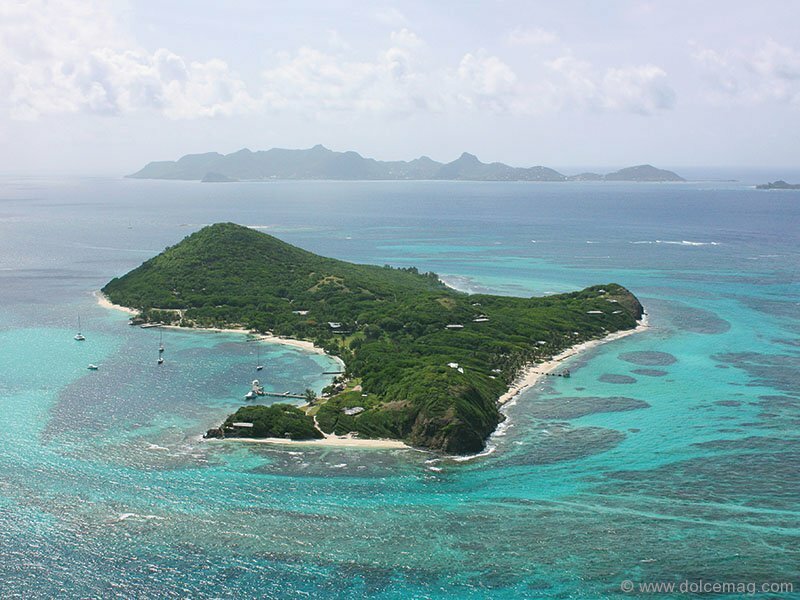 A day trip to Tobago Cays Marine Park to walk with iguanas and swim with turtles is a popular activity. An absolute must is a five-minute boat ride to Mopion Island, a sublime sandbar surrounded by coral. Save for a thatched umbrella, the deserted strip of sand seems to float on a waterbed of turquoise seas. For days when you can’t help but stay on the island, your private butler will drive you to a private palapa on the West End Beach, where streaks of pink and orange paint the sky at sunset. 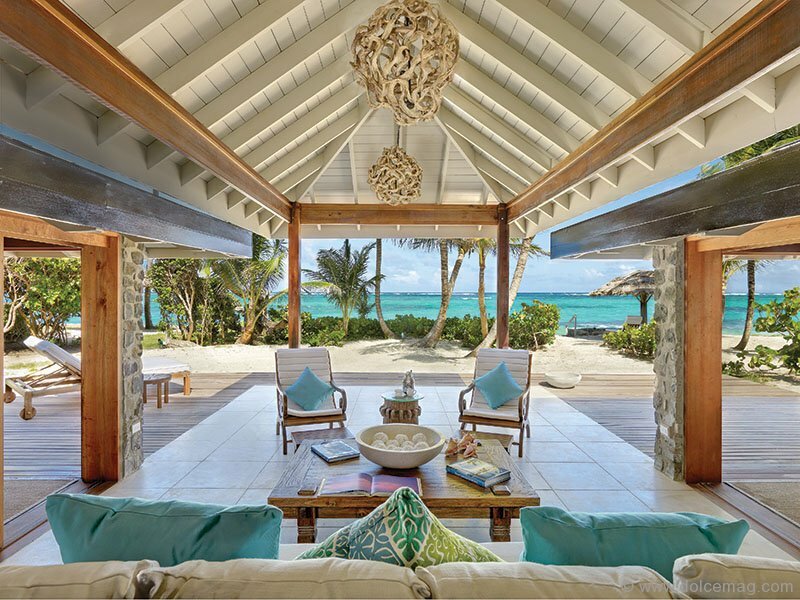 Of rolling hills and postcard beaches, an unplugged private island anchored in the Grenadines marks an understated presence on the travel destination radar. No phones. No televisions. And forget about WiFi. 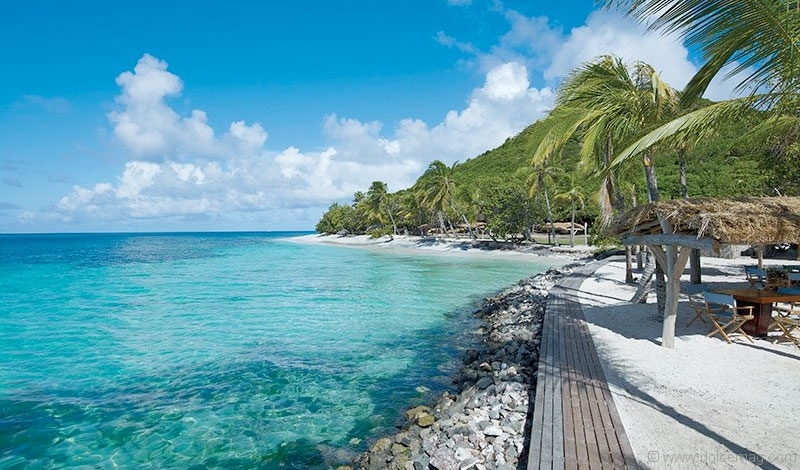 But it’s precisely this essence of simplicity and seclusion that makes Petit St. Vincent — and the journey to reach it — that much more worth it.